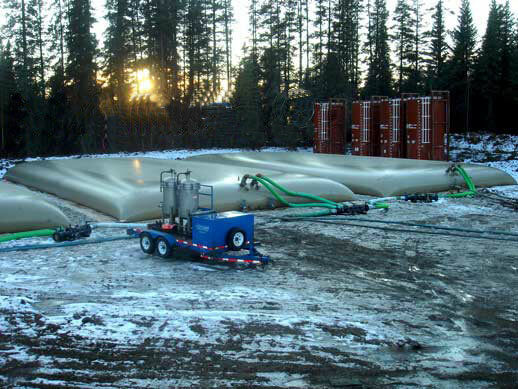 Our Portable Frac Tanks can additionally be used as a type of secondary containment in oilfields and hydraulic fracturing sites. These tanks can be used as a substitution to the pit liner, allowing frac water to be pumped directly into the tank for temporary frac water storage. This increases the storage ability in your area and helps to prevent ground contamination due to leaking. The collapsible pillow tank for fracking features high-strength liner and tank materials. These materials have a high puncture resistance and are equipped to handle not only the nature of items stored within the tank, but also the nature of various outdoor elements and temperature demands. Depending on your intended storage application, the pillow tank can be made with materials that meet the requirements for water storage, chemical-based liquid storage, and even fuel. When specifying your desired tank, please be sure to let us know what liquid you intend to store so we can provide you with a tank compatible to that material. Fabrics: Due the nature of fracking sites, the flexible frac tank is typically made with high strength materials such as a 32 or 34 ounce urethane. These materials hold a high resistance to various elements and are thick to help prevent abrasion and additional wear and tear on your tank. Capacities: Capacities for these tanks include sizes anywhere from 50 to 250,000 gallons. This wide range of storage capacities is designed to provide multiple tank options for best meeting your storage needs. When compared to a standard steel tank (which typically stores 400 to 600 bbl), a moderately large frac tank of 150,000 gallons can store around 3750 bbl. Fittings: Tank fittings can be built to match your specifications or site requirements. Tanks are often set up through a series of pumps and piping equipment. Standard fittings include fill/discharge ports, drain floor ports, hoses, and a vent.